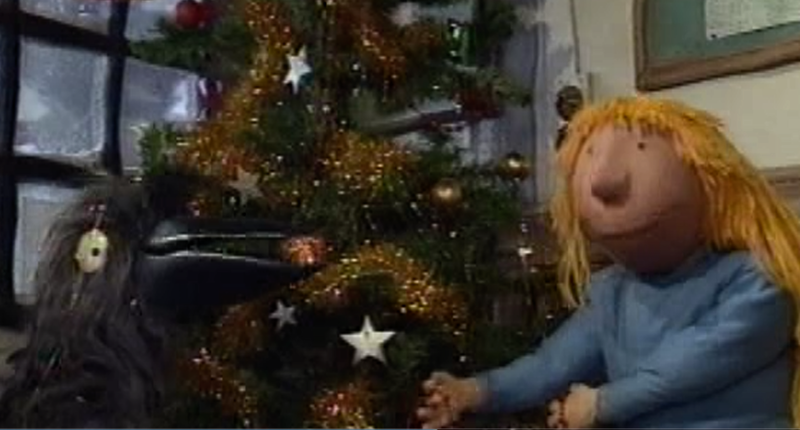 Mortimer and Arabel’s Christmas Spirit…! In a hilarious ghostly Christmas adventure Mortimer seeks out his Raven ancestors at the Tower of London – and finds more than he bargained for! 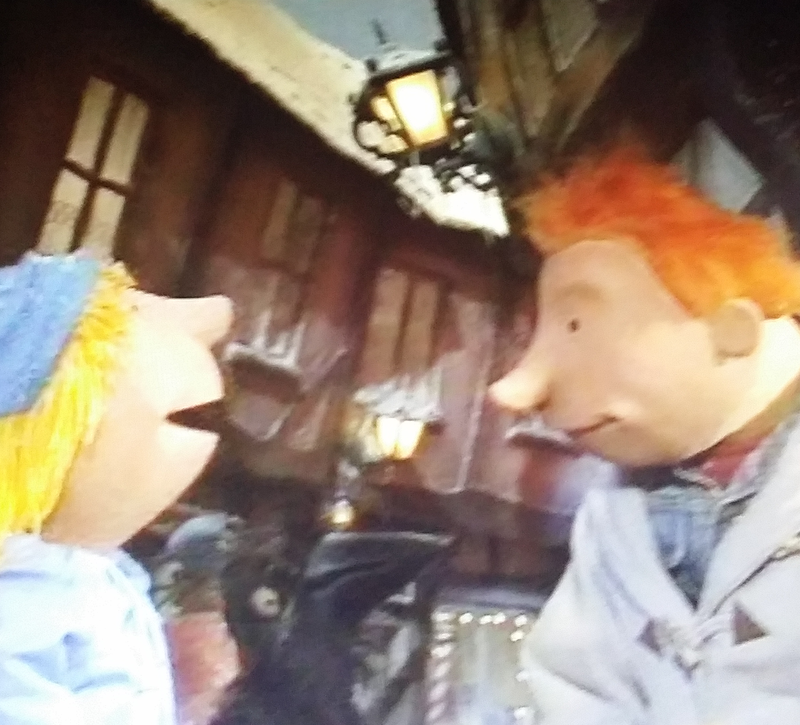 At last you can download the TV adventures of Mortimer and Arabel brought to life by a talented puppet team for the BBC, based on original drawings by Sir Quentin Blake, and first shown nearly twenty years ago…some of us have been waiting very patiently indeed…!!! It’s perfect timing for this story full of festive spirit – the ghost of Elizabethan poet Sir Humphrey Burbage is having his usual nightmare before Christmas trying to pay off his long-standing debt to the Duke of Rumbury – before he loses his head…! 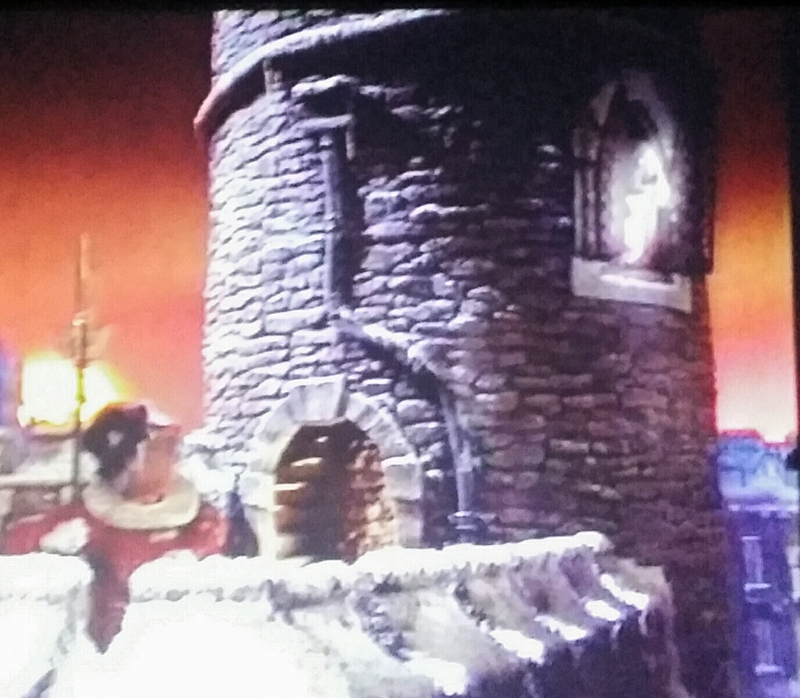 That’s him at the tower window waiting for his faithful raven, but when Mortimer turns up instead chaos is sure to follow. Can Mortimer and Arabel find his gold and get it to the Bank on time? 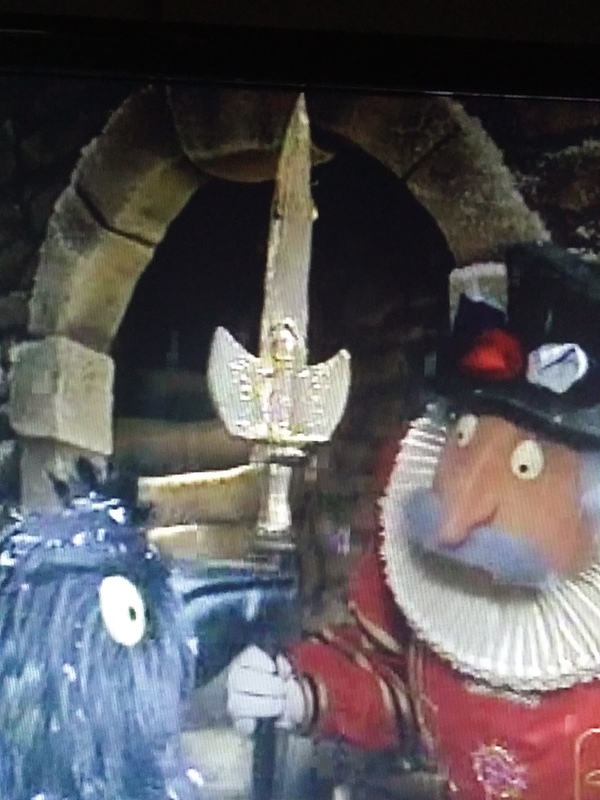 Malcolm James and his design team at the BBC pulled out all the stops for this delightfully detailed puppet series, and this very merry Christmas episode – Mortimer and The Bank Ghost – has settings which include a snowy Tower of London, and the half-timbered streets of old Rumbury Town complete with carol singers, plum puddings, turkeys, and decorations to die for…! The script is hilarious, full of ghostly puns and seasonal mayhem. 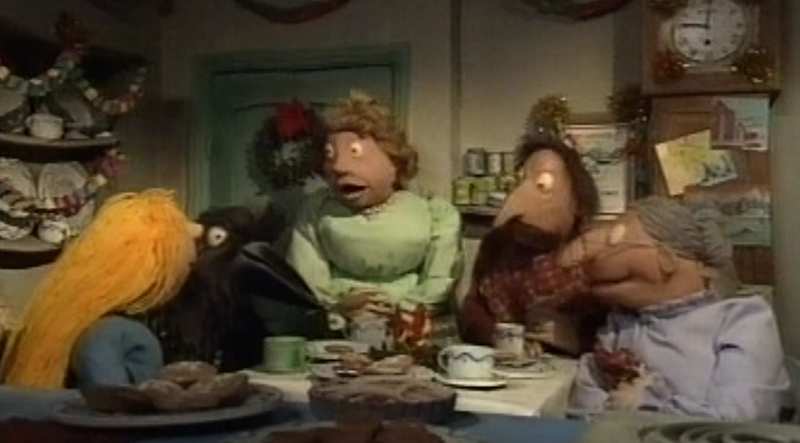 While Granny Jones is trying to make the Jones’ Christmas dinner (with one-hundred year old mincemeat) Mrs Jones is at the Bank trying to make some extra Christmas cash to pay for it all – but in terror of bumping into the Bank Ghost! But of course everything miraculously ends happily (and ever-after at last for poor Sir Humphrey!) and a very Merry Christmas is had by all – even Granny Jones’s horrible cat Augustus gets away with a turkey leg. And Mortimer and Arabel get the best surprise of all…something wonderful in their Christmas stockings…but to find out what that is you’ll have to watch it for yourselves! In the year when Joan Aiken would have celebrated her 91st Birthday, she would have been astonished to see the outpouring of love, gratitude and admiration honouring her, let alone the appearance of a ‘Wolves’ Google Doodle celebrating her birthday, and her writing. Could she have known that years later her books would continue to tell the story not just of her own alternative kingdom, but of the one we live in today? Her stories, particularly the series known as The Wolves Chronicles, seem meant to become part of the fabric of history. More than ten years after her death there continue to be reprints, translations and new digital editions of the books. A new generation of parents are passing on their own childhood favourites – and new generations of writers continue to acknowledge her ever fertile influence and memorable writing skills. 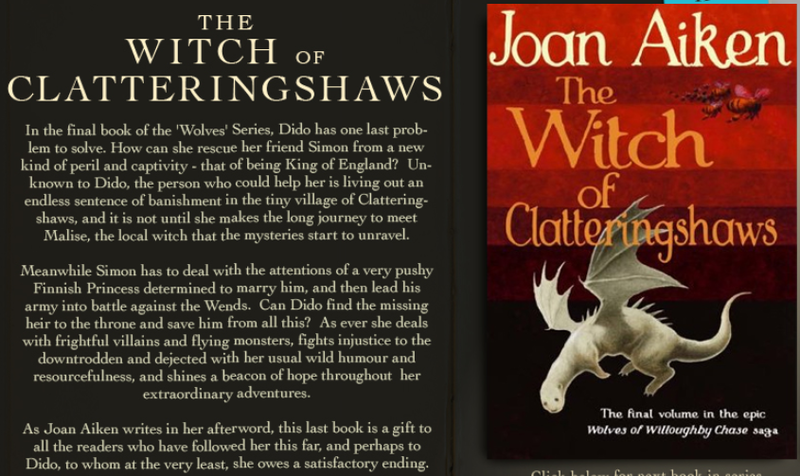 Can it be a coincidence that the heroine – The Witch of Clatteringshaws – of Joan Aiken’s short and sweet conclusion to The Wolves Chronicles which she produced during her entire writing life, was also, years before Pratchett’s, a down-to-earth social worker witch who in Aiken’s book visits her flock on a flying golf club, and who has been charged with the task of saving her kingdom? The two writers share more than the coincidence of themes – they both employ a rich store cupboard of mythical and historical references and jokes for the well-read follower – and they are both sharing their real world view however it may be disguised in fantasy, and at the last, do so much more explicitly. Aiken had an extraordinary prescience – her England at the end of her alternative historical sequence, has reverted to Saxon times, even pre-historic with the inclusion of some strange and magical creatures – the mysterious Hobyahs, and the flying Tatzelwurm. But despite its connecting rail-roads, which like Pratchett’s iron rails, criss-cross the country, the disunited kingdom has been drawn and quartered into separate regions with railway border guards – a foretaste of the divisions to be caused by Brexit? Invading tribes are more like waves of immigrants – the Wends who arrive in the North to do battle, after fraternizing rather than fighting with the English troops, decide this would be a better country in which to settle, and Joan Aiken imagines them as the early cheese-making inhabitants of Wensleydale, whose culture then becomes part of the Island’s history. Towards the end of the series her imagined fractured country was still changing, and although some reviewers saw Joan Aiken’s view becoming darker in the later books, her stated philosophy – that there should always in her children’s writing be a ray of hope at the end – carried her through to offer this last crazy Shakespearean jig of a tale to sustain her readers despite the dramas and dangers that have passed before. Her alter-ego, Dido Twite, ever practical and philosophical, ever willing to help those who are unhappy or unable to help themselves, ends on her own note of joyful forgiveness for her murderous father, one of the great villains of Joan Aiken’s creation. Dark this world of her creation may have been, but no darker than the real England or Europe of today, and what Joan Aiken and Terry Pratchett shared was the gift of fantasy – they were able to show through storytelling the hopeful vision that fiction can offer us, and how it becomes the pattern of history, in stories aimed at both adults and children – stories for anyone who has ears to hear. Start at the end why not? 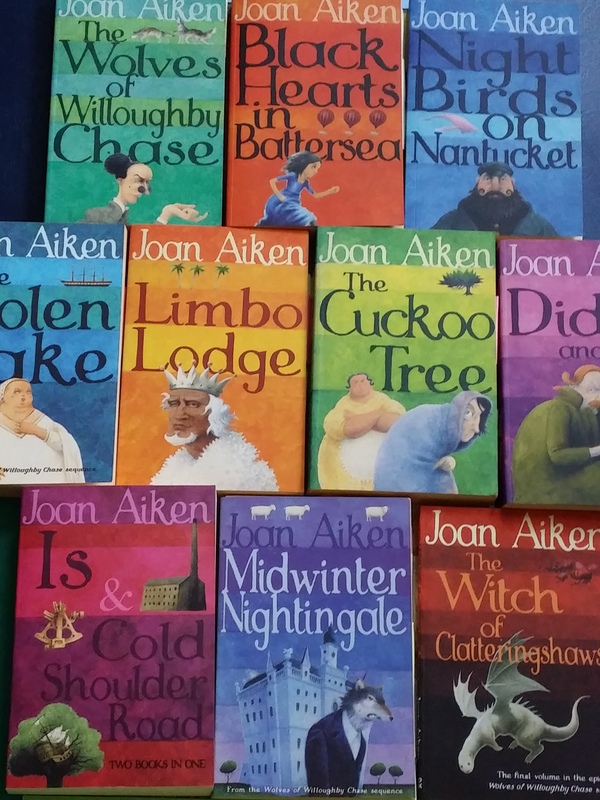 A marvellous introduction to the world of Joan Aiken…! Joan Aiken’s Happiest Birthdays… and a couple of alarming ones! Joan Aiken was born on September 4th 1924 in a haunted house named after a mysterious astrologer, Samuel Jeake (who was supposed to have built a flying machine) in a street named after a mythical mermaid (who Mr Jeake may have rescued from an angry mob in his flying machine…) in the little town of Rye by the sea in East Sussex. All these elements were to have a lasting place in her imagination, and that particular haunted house would appear in many of her favourite stories. At the age of five Joan moved to a small village and the house of a new step-father; it was a place she came to love, as she had a good deal of freedom and was taught at home by her mother, but in 1936 her life changed dramatically – she was sent to a small boarding school in Oxford, and spent her twelfth birthday away from home for the first time. She said it was an inconceivable shock, and that from then on she stopped growing! Years later she wrote about the experience in a novel called The Shadow Guests, where a boy deals with the difficulty of school life by retreating into a world of ghostly imaginary friends. Writing was clearly the answer, and her first term’s report said she showed promise… she did grow to love her time there, publishing her first poems in the school magazine. Just a few years later World War II, declared just days before Joan’s birthday in September 1939, led to the school’s bankruptcy and eventual closure. This was the beginning of her most famous book, originally named after its heroine Bonnie Green, and now known to everyone as The Wolves of Willoughby Chase – which she began on September 4th 1953 in this old exercise book, but which wasn’t to be published until nearly ten years later. September 1976 was also a special birthday. Two days before, Joan married New York painter Julius Goldstein, they were to share nearly thirty years of happiness, dividing their time between her home in Petworth, Sussex, and his apartment in Greenwich Village New York. Joan’s most amazing birthday, which would have been her 91st, came the year when Google decided to make the 4th September Joan Aiken Day and celebrate her wonderful career as the writer of over 100 books which have become favourites and classics all over the world. she left for us to enjoy! with added material about Joan’s school days and more!